Millions of Americans sat glued in front their TV to watch the much awaited, highly anticipated and widely publicized Battle for Greatness boxing match between Manny Pacquiao and Floyd Mayweather in Las Vegas. Most of them, however, felt let down and frustrated at the ring of the bell; not due to Mayweathers’s strategy of flying like Muhammad Ali… umm a butterfly around the ring but due to pay-per-view issues and delivery glitches that prevented them from fully enjoying the match. The organizers managed to create a great hype around the fight and it became the second highest selling pay-per-view event of all time. DirecTV sold 1.15 million pay-per-view subscriptions, while Dish 500,000. The telephone companies combined for 600,000 making it whooping 2.25 million combined. Thousands of subscribers from virtually every corner of the U.S. complained about technical issues with pay-per-view TV. Direct TV customers in Los Angeles, Charter Communications subscribers in St. Louis and Comcast Pay-per-view subscribers in Seattle were reported to be without service for three hours during the boxing match. There were also tweets from Time Warner Cable subscribers in the U.S. that the fight was being delivered to them in Spanish. Callers were told, “All circuits are busy” when they contacted TWC to resolve the issue. Most of these poor chaps had paid more than $100 to see the match live on their TV sets but didn’t receive it properly as Pay-TV operators were KO’d by technical problems. Although majority of the people who suffered from pay-per-issue had no option but to endure the inconvenience the smart ones chose to watch the match live on video streaming apps. Those who used this workaround bragged on twitter how they avoid paying the $100 fee for watching the fight live on TV without any inconvenience or glitches. 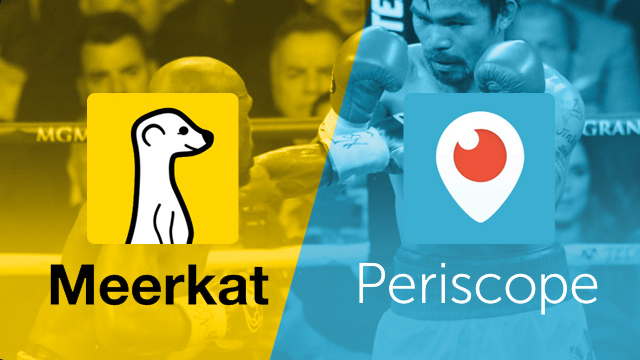 Video streaming apps like Meerkat, NetFlix, and Twitter’s Periscope streams video directly to the internet that people can view on their PC, smartphones, and tablet devices. Streaming videos means watching video in “real time” without having to download it first on your computer. With real time video streaming, you can watch live events and shows similar to watching it on your TV via cable or satellite. The trend is clear. More and more people now prefer live streaming to live programming. But in order to enjoy streaming videos you need to have a broadband connection. You broadband connection must run fast enough to stream videos without any delay. Most video streaming sites have built in video player that “buffers” data that has already been received. So, if there is a slight drop in broadband speed due to congestion or other reason, the video is not interrupted as it is stored in the buffer. The video will momentarily pause in case the buffer runs out and resume immediately once it catches up. Due to rising popularity of video streaming sites, some say that the next bout will be between streaming video sites and pay-per-view providers. So, who will you support in the next match between the video content providers? Let us know.